Why China and Taiwan are divided? – COME MAKE IN INDIA.SELL ANYWHERE AROUND THE WORLD. Why China and Taiwan are divided? In 2014, senior officials from Taiwan and China have held two meetings in each other’s territory. Both meetings were the first formal contact between the two governments since 1949. In recent months officials from Taiwan have been proposing an even bigger breakthrough in relations: a meeting between their president, Ma Ying-jeou, and his Chinese counterpart, Xi Jinping. They have suggested this take place in Beijing in November in the margins of a gathering of leaders from the Asia-Pacific region. China has responded coolly to the proposal and has not invited Mr Ma. But even if a meeting does not happen in November, hurdles to one appear to be falling away. Why has this taken so long? Taiwan was once a province of China. It is still officially regarded as such by both governments. The problem is that neither side agrees on what the “China” in question is: the People’s Republic of China, ruled by the Chinese Communist Party, or the Republic of China, ruled by the Chinese Nationalist Party (commonly known as the Kuomintang, or KMT). The KMT ruled China for more than two decades until 1949, when it was overthrown by Mao’s Communist Party and fled to Taiwan. Since then the island has retained the name Republic of China, even though the government there only administers the island of Taiwan itself and a few other much smaller ones. In Taiwan, there is an added complication to the use of the term “Chinese province”. Between 1895 and 1945 Taiwan was ruled by Japan, which had seized it after a war with imperial China. Especially in the early years after 1945, KMT rule on the island was brutal. Taiwan has since become a democracy, but resentment of the KMT runs deep among many of those who were living on the island before the KMT took refuge, and the descendants of such people. Their identity with greater China is weak. Some want Taiwan to abandon any pretence of a link with China and declare independence. But perhaps an even bigger reason why the Chinese and Taiwanese presidents have yet to meet is that the Chinese civil war is not officially over. The government in Beijing does not recognise the government in Taipei, and thus does not accept that it has a president. Although the two sides stopped lobbing shells at each other in the 1970s and began talks in the early 1990s, progress has been slow. Discussions were held only through intermediary bodies, while Taiwan’s democratisation soon intervened. Taiwan’s then president and KMT leader, Lee Teng-hui, organised the island’s first direct presidential elections in 1996. In an appeal to native Taiwanese, he shifted his government’s rhetoric to talk not of “one China” but of two states. This effectively granted recognition to the government in Beijing, but it also infuriated it. The Communist Party feared a slide towards Taiwan’s formal declaration of independence and tensions flared. China lobbed unarmed missiles into the Taiwan Strait; America sent aircraft carriers to warn it off. The victory of Mr Lee in the presidential elections, and of the pro-independence Democratic Progressive Party in two subsequent ones, stymied further progress in cross-strait talks. 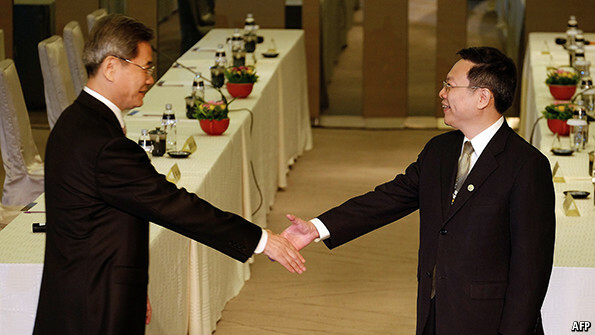 It was only when the KMT came back to power in 2008 under Mr Ma, a less confrontational politician, that the Communist Party began allowing talks to resume again in earnest; at first through the usual proxies and then this year in the first direct government-to-government meetings. These encounters between the heads of the Chinese and Taiwanese government agencies in February and June were a concession by China. They conferred at least a degree of legitimacy on the government in Taipei. But there are more hurdles to cross before the presidents can meet. One difficulty is finding the right occasion. Mr Ma has proposed the summit-level Asia-Pacific Economic Co-operation (APEC) forum because those attending will be doing so as “economic leaders”, not heads of state. This would allow the two sides to side-step the question of whether Mr Ma can be said to head a state, and if so what that state comprises. But China does not want such an encounter at an international gathering; it would smack of giving foreigners the right to peer in on what it regards as a purely domestic issue. Yet if Mr Ma were to visit Beijing without the cloak of a gathering like APEC, then the issue of his title would become more prominent. China would probably refuse to greet him as president. The Taiwanese public would probably balk at the idea of him being treated as anything less. There remains a long road to travel.